I DID NOT want to wake up this morning. I slept 8 hours and I was still groggy and tired. I made it to work on time anyway and I was in for a pleasant treat. My friend Jill got me one of my favorite "go to" breakfasts from Pressed Cafe in Burlington. I love their overnight oats. 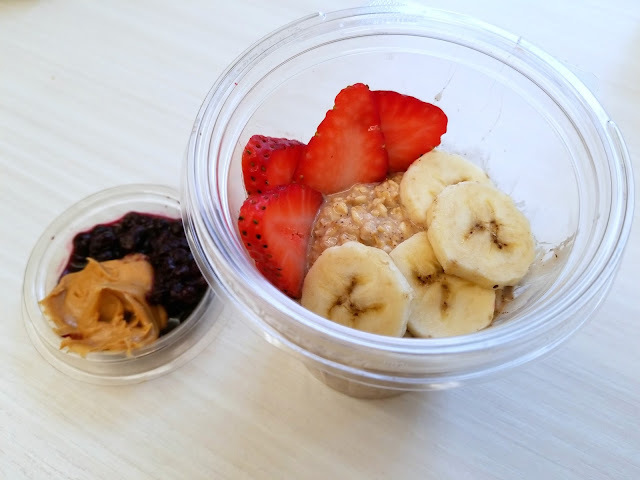 Its a cup of oats with milk, peanut butter, homemade blueberry compote, strawberries and ripe bananas. It's definitely a "treat" because the portion is on the larger side and the calories quickly add up with the natural sugar and peanut butter. Needless to say, my day got better real quick! 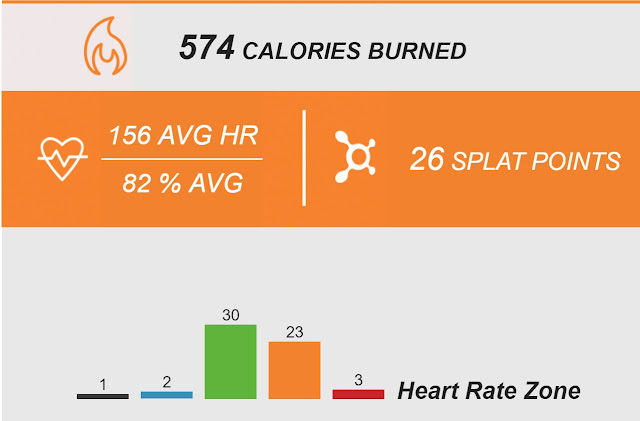 At noon, I hit up OTF for an Endurance workout. At the beginning of class, Chrys challenged us to get our 5K check off on the OTF Bingo game. We would have to run a 5K (3.1) during the treadmill portion and she would let us use the "warm up" to add the extra mileage since a typical tread block does not exceed 24 minutes. I love challenges! I decided to go for it! Instead of walking during warm up, I started to jog at 5.5 before the workout started. Once we were at a push, I upped it to 6.6 to get going. When we were at base, I tried not to go lower than 5.5 MPH. My mind was made up to get to that 5K. I felt great the first two blocks then started losing steam during the last 2 blocks. My "all out" wasn't a true all out and my pushes were getting weaker. My heart rate was in the red a few times and hard to get back to green during recovery. For someone that worked and coached 5 classes since 5 in the morning, Chrys was amazing at keeping us going and trying to get us past the finish line. I ran for 28 minutes and got to 2.5 miles. I did not hit my goal for the class but I still felt great. It was the fastest average "race" time I've ever ran so I guess that is a PR? Next time, I will try to not take too many breaks. After I got of the tread, Chrys gave me great pointers on how to get closer to my goal next time. Thanks Chrys! The floor was a great template today. NOT MUCH ROWING! I was exhausted and too so much time to recover. TRX lunge to pistol squat. We finished the block with a 1 minute push on the rower to a one minute all out. 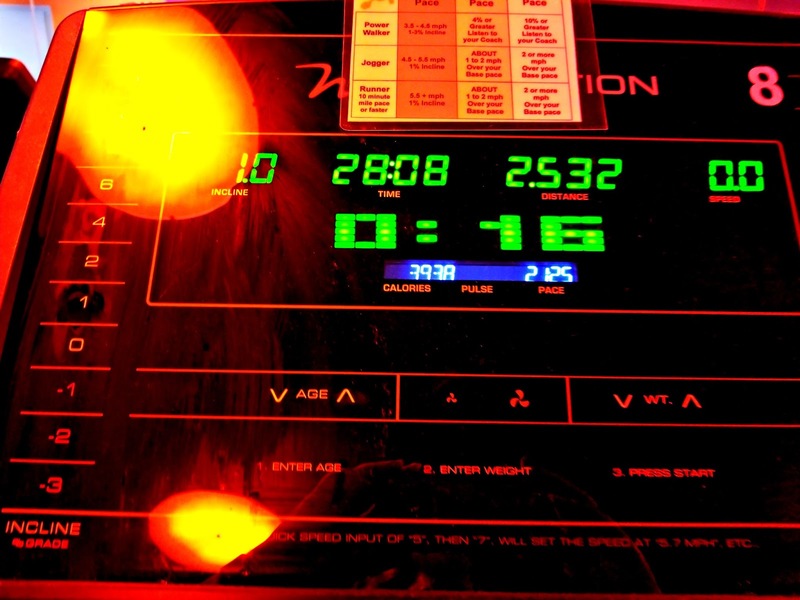 By this time, I got caught slacking and Chrys pushed me to get to orange on the rower. It was a really challenging workout but I was happy to survive it. Also, a lot of members are playing the OTF Bingo game and one of the boxes encourage members to interact with each other. 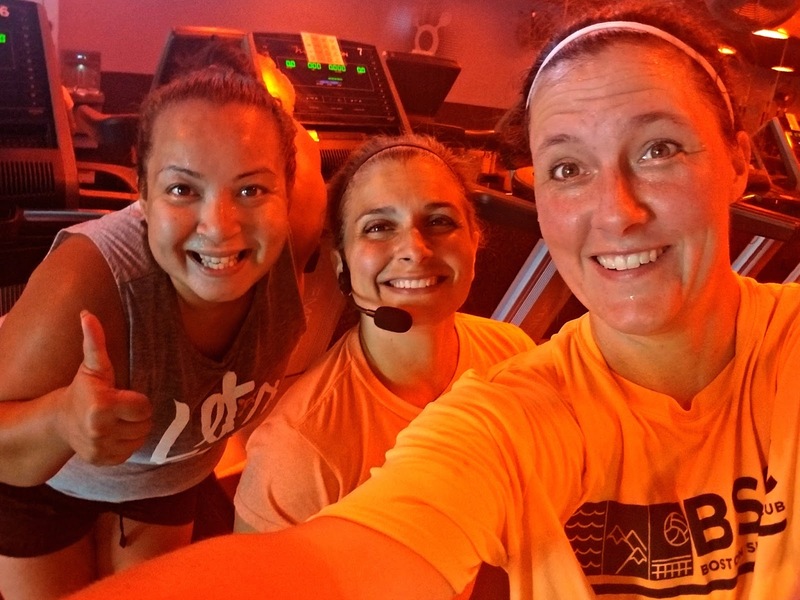 Today, I "Hi Fived" someone I didn't really know and became FB with Patty C. The photo below earned a few bingo squares: Tag new workout friend, take an endurance class, complete a 5K (Patty), and take a selfie with a coach. Work went by quick since there was so much to do. I was looking forward to my free "Open House" workout at the new Bfitt60 studio in Billerca. I strapped on their loaner heart rate monitor that is the same as the OTF Mio heart rate wrist band. 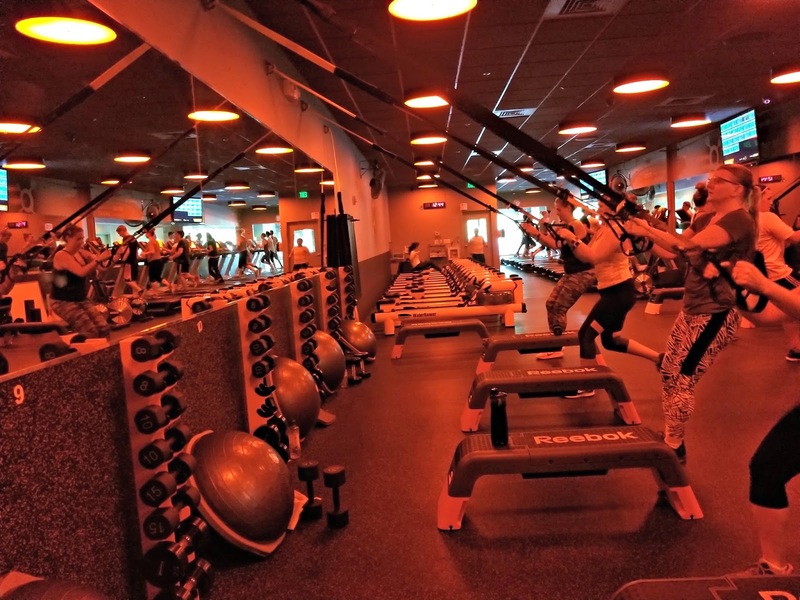 The studio manager explained that since it was a "Strength" day, the focus was on low reps and heavier weights. I arrived as another group was finishing and I have to admit, I was intimidated by some of the workouts they were doing. We started off with a 9 minute dynamic workout. We used the foam roller to roll out my back, calves, shoulders and legs. We moved towards the band and did some mobility work there. I felt a good stretch along the side of my ribcage/obliques. I really liked that Rob showed me how to stretch using the elongated rubber band attached to the TRX since I've never done that before. It was time to start the first workout. We started with 3 exercises that needed to complete 3 rounds in 9 minutes. Rob was good about correcting my form and having me put my toes to "10" and "2" clock position. I also had to be reminded a few times to hinge at the hips and do a dealift not a squat. Since I was going through the workouts quickly and had alot of time left, he upped the weights from 15 to 25 each side for the shoulder press and from 50 pounds to 88 pounds on the dead-lift. I struggled the last set on the should press but the kettle bell was OK. The coaches were surprised to see that I could do 3 sets of (12) good form push ups since they offered that I try the modified knee version. The bear claw with the sandbag pull through was killer. That got my heart rate up for sure. Not only did I have to crawl low (not touching the ground with my knees), I also had to pull a 22 pound sand bag through my legs across the field. After doing that twice, Rob wanted me to try their new equipment out. It was a bright orange bungee cord with a belt attached to it. I strapped in and he set a goal for me to touch the line and return crawling backwards. The first time I did it, my sneakers was about to come off but I made it. Returning was trickier than going because I had to walk backwards and I literally couldn't see the finish line. It was time for conditioning. I thought, " I got this!" I had to pedal up to 25 calories on the airbike then do 10 low weight dumbell overhead thruster . I had to complete 3 rounds in 12 minutes. The bike was NO JOKE, it was much harder than I thought. 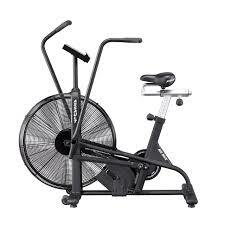 I had to use my arms and legs to pedal the bike and it took between 75 secs to 90 secs to reach 25 calories. My heart soared to 85 % real quick in that one minute. I got off the bike and started my overhead presses. It took what seemed like FOREVER to finish the last airbike workout. I even had to take a quick stop to catch my breath. We finished the class with some stretching. The monitor wasn't displaying my heart rate at this time since there was a glitch but I don't think I earned "12 splat" points. It was good and it was like personal training by two coaches since I was the only one there. I will definitely try another classes. 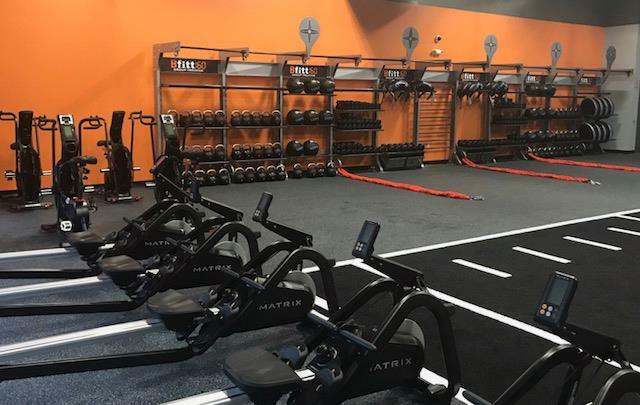 For pricing and more info about Bfitt60, check out yesterday's blog post.